Mumbai : American Tourister credited with making backpacks synonymous with swag, has upped the style quotient this year with its cool new range of backpacks and uber cool new communication. American Tourister has stepped into another successful year to celebrate its association with the international sports icon Virat Kohli. After the success of the #SwagPack campaign, the brand has pushed the bar higher, with the new ‘#GoSwagPackin’ campaign. With this campaign, American Tourister launches its new range of fashionable, cutting edge, swag worth backpacks made for today’s young and adventurous world traveller. 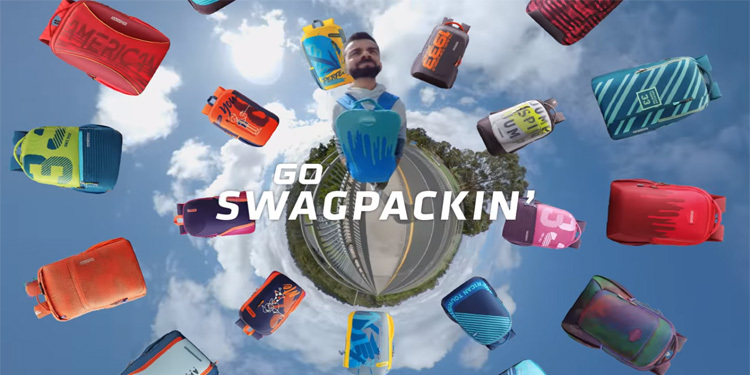 ‘#GoSwagPackin is part of a broader cross-platform campaign, the highlight of which is a TVC and digital videos that use a new camera technique. These are built around the emerging 3D technique known as ‘tiny planet’, which turns a panorama image into a stunning miniature world. In addition to Virat, as an extension to this campaign, we have othercelebrities, influencers and icons who best represent the globetrotting Indian of today on social media. The digital campaign will alsoinclude several interesting,fun activities connecting with the tweens, teens and youth of the country. The TVC opens with Virat walking across a bridge with his American Tourister backpack when the world suddenly morphs around him. Now front-and-centre in his own ‘tiny world’, Virat travels across different parts of a global city having fun with his swagpack and showing off his swagger. As he reaches his final destination, the entire range of backpacks comes together to form a halo circling the world. Mixed with groovy pop beats, the soundtrack paints the campaign in words while Virat makes the world go round, literally, with a stunning visual treat. It compels the viewer to pick up an American Tourister backpack and Go SwagPackin’.